All-sky map of the Swift-BAT 105 month sources. Click to see the whole features. The 105 month Swift-BAT survey is a uniform hard X-ray all-sky survey with a sensitivity of 8.40×10 −12 ergs −1 cm −2 over 90% of the sky and 7.24 × 10 −12 erg s −1 cm −2 over 50% of the sky in the 14 − 195 keV band. The Swift -BAT 105 month catalog provides 1633 (423 new detections) hard X-ray sources in the 14 − 195 keV band above the 4.8σ significance level. Adding to the previously known hard X-ray sources, 32% (137/423) of the new detections are identified as Seyfert AGN in nearby galaxies (z < 0.2). The majority of the remaining identified sources are X-ray binaries (7%, 29) and blazars/BL Lac objects (9%, 36). As part of this new edition of the Swift-BAT catalog, we release eight-channel spectra and monthly sampled light curves for each object in the online journal and at the Swift -BAT 105 month Web site. Using nearby and bright hard X-ray selected AGN, I showed that [NII]λ6583/Hα ratio exhibits a significant correlation with λ Edd(RPear=-0.44, p-value=3x10-13, σ=0.28 dex), and correlation is not solely driven by MBH or Lbol. The observed correlation between [NII]λ6583/Hα ratio and MBH is stronger than the correlation with L bol, but both are weaker than the λEdd correlation. This implies that the larg-scale narrow lines of AGN host galaxies carry information about the accretion state of the AGN central engine. We propose that the [NII]λ6583/Hα is a useful indicator of Eddington ratio with 0.6 dex of rms scatter, and that it can be used to measure λEdd and thus MBH from the measured Lbol, even for high redshift obscured AGN. Possible physical mechanisms behind this correlation are 1) mass-metallicity relation, 2) X-ray heating, and 3) radiatively driven outflows. BPT diagnostic diagram as a function of Eddington ratio for hard X-ray selected AGN (BASS). Click to see the whole features. Black hole mass and bolometric luminosity distribution for type 1 AGN as a function of type 1 AGN fraction (color), Click to see the whole features. 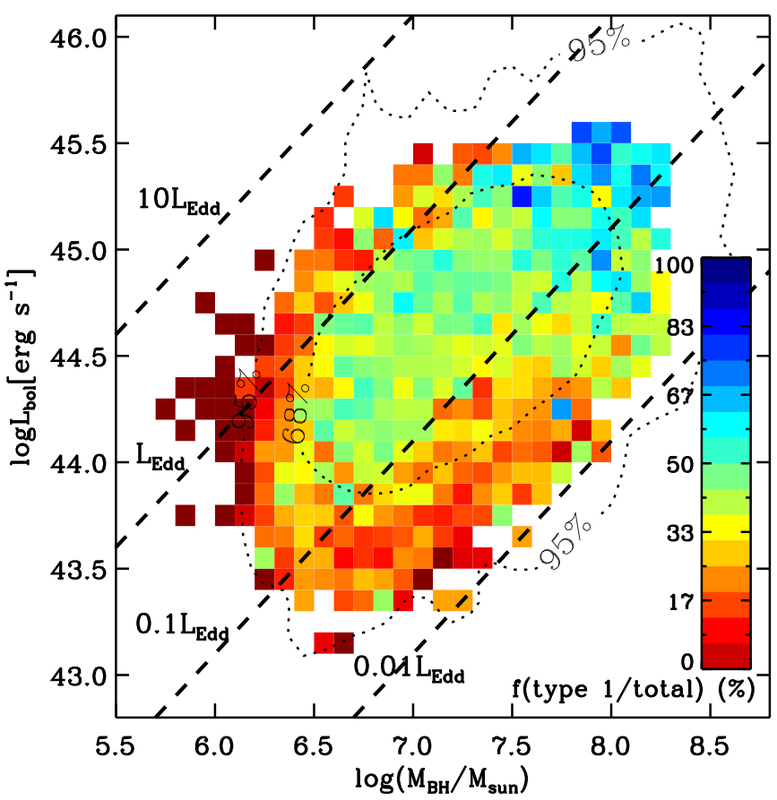 I discovered a substantial number of unidentified and unexplored population of galaxies featuring weak broad-line region in the nearby Universe (z < 0.2) and investigated their implications on the AGN unified model. Through this research, I proved that the receding torus model is only partially valid and it requires more valid formulation to explain the current observational results. Furthermore, I showed that neither black hole mass nor bolometric luminosity solely determines the type 1 AGN fraction which is a measure of an average torus opening angle. I presented the statistical properties of a volume-limited sample of 7429 nearby (z = 0.033–0.044) galaxies from the Sloan Digital Sky Survey Data Release 7. Our database includes morphology distribution as well as the structural and spectroscopic properties of each morphology type based on the spectral line strengths (the OSSY catalog, Oh et al. 2011). Our database does not include galaxies that are apparently smaller and flatter because morphology classification of them turned out to be difficult. Our statistics confirmed the up-to-date knowledge of galaxy populations, e.g., correlations between morphology and line strengths as well as the derived ages. Samples of the SDSS DR7 composite images of morphologically classified galaxies in the Hubble Sequence. Click to see the whole features. Example of spectral line decomposition. Click to see the whole features. Spectroscopic data provides a fossil record of galaxies featuring stellar absorption and nebular emission lines. The prominent stellar absorption features give us the average surface gravities, effective temperatures, metal abundances, and kinematics of stellar components. Nebular emission lines, on the other hand, probe the physical state of the ionized gas in galaxies and thus can be used to trace the nuclear activity of central supermassive black holes, or their instantaneous star formation rate. From the detailed and improved analysis of more than half million SDSS galaxy spectra (z < 0.2, N=664,187), I released a publicly available galaxy line strength database (the OSSY database) to the community which provides the strength of nebular emission lines, stellar absorption lines, and stellar velocity dispersion. The OSSY database provides more accurate line strengths by decomposing nebular emission lines from stellar absorption features. The OSSY database also achieved better spectral line fitting by adopting empirical stellar templates compared to the SDSS pipeline. Moreover, the database provides a quality parameter assessing the goodness of spectral line fitting so that users can chose proper datasets based on their purposes.